The Marine Corps awarded a $35.8 million, five-year contract to American Systems Corp., Chantilly, Va., to train pilots to escape from aircraft and amphibious vehicles that crash into the ocean. 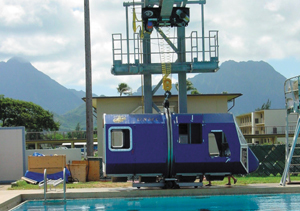 Under a previous contract, ASC made the dunker machine that simulates CH-46 or CH-53 helicopters crashing into water and provided training support. The new contract has options for the Marines to modify the trainer to simulate other vehicles. It can be modified to simulate the interior of several vehicles that travel over water, including an amphibious vehicle or an M-22 Osprey Tilt Rotor aircraft.